The 2017 Minibeds-on-Plastic experimental garden in late 2016. In Part 1 of this series I introduced you to Paul Gatuschi and his the Back To Eden gardening. In Part 2 I provided some insights into his system of gardening. This essay I will begin to look at similarities and differences between my Minibeds-on-Plastic gardening system and the Back To Eden system. First, and foremost, there is the matter of covering the soil, a.k.a., mulching. This is fundamental to Back To Eden gardening, and it is fundamental to Minibeds-on-Plastic gardening. 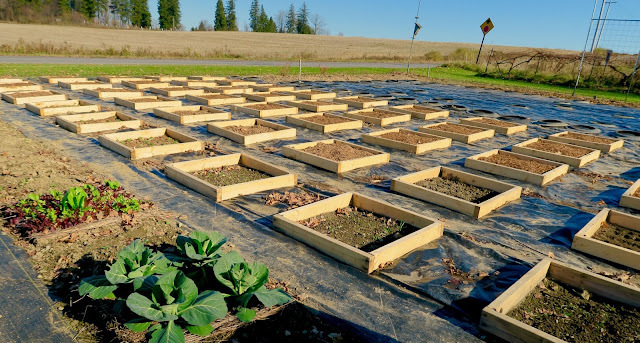 The difference is that Back To Eden gardening is known for promoting the idea of using wood chips for a soil cover (but in more recent interviews, Paul Gautschi says that the mulch doesn’t have to be wood chips. It can be whatever you have—even rocks), while the Minibeds-on-Plastic system utilizes a single, large, thick sheet of black plastic. The whole point of any mulch is to protect the soil—to keep it from drying out, to reduce compaction, to promote biological activity, and to suppress weeds. Mulch is important, especially with a no-till gardening approach, which is also common to Back To Eden and Minibeds-on-Plastic. Specifically, the suppression of weeds is the biggest and most desired benefit in many gardener's minds. This is especially the case if they have some experience gardening. Unwanted weeds will, obviously, rob your garden plantings of soil moisture, soil nutrients, underground root space, and aboveground access to sunlight. As a rule, vegetables do not suppress weeds, the weeds suppress vegetables. My experience has been that natural mulches like wood chips will suppress a LOT of weeds in the garden, but they never suppress all the weeds. Black plastic mulch, however, will suppress ALL the weeds in the area it covers. Not some. Not a lot. All. That’s a powerfully endearing quality. In the book, Teaming With Microbes, Jeff Lowenfels states in the first paragraph of his chapter on mulches that “black plastic sheeting makes great mulch.” Then he goes on to ignore black plastic as a mulch and focuses on natural mulches. This is the usual bias among people who garden organically or naturally (it was my bias for more than 30 years of gardening). The exception to black plastic mulch bias is a great many organic market gardeners and small farmers. They have seen the enormous benefit of using a black plastic mulch, and this has been the case for decades. While many organic food producers don’t like to use black plastic, they know how well it works for them. They have to be pragmatic about black plastic. They have to take into account success and production. It’s much easier to have a successful garden when you have virtually no weeds to deal with. Among the drawbacks to using black plastic mulch, the Rodale report notes that plastic is inherently unsustainable and difficult to recycle. Fair enough. But plastic is also ubiquitous these days, and its use can be as easily justified as it can be condemned. My justification is that, in the form of a black sheet in my garden, plastic allows me to achieve a measure of plant yield, overall success, and personal satisfaction that I can not otherwise get (considering the time I have for gardening, and my overall physical ability). Besides that, I sided my house with wood instead of plastic, I never drink soda (no plastic soda bottles), and I frequently refuse to take a plastic bag for small purchases. (“I don’t need the bag, thanks. Save a tree!” is my standard reply—which gives you an idea of how long I’ve been ecologically minded). So, I reckon I’m eligible for some sort of moral offset when it comes to the oft perceived “sin” of using plastic mulch in my garden. Hmmm. Those temperature differences are actually less than I would have thought. Are they enough to ruin the soil biology under the plastic? I don’t really know. The Rodale study did not look at soil biology. They only suggested that the soil biology may be negatively affected. I wish they had taken a closer look at that aspect. And how deep were those temperature readings made? I can’t find that in the report. Was it at the soil surface? Down one inch? Down 2 inches? It seems like depth would make a difference. Is the soil biology devastated by such heat, or it merely inconvenienced and temporarily set back in certain areas of the mulched soil? Based on my past experience using black plastic mulch, I have a feeling that the temperature under the plastic is not going to be a big issue. But this is something I plan to test in my 2017 experimental garden. The bottom line here is that black plastic is an incredibly effective garden mulch. The only real drawback I can think of at this time is the absence of aboveground biomass, and the soil benefits that come from such biomass. But Minibeds-on-Plastic gardening (as I am pursuing it) does not ignore biomass and soil biology. Not at all. I’ll discuss those things in the next (and final) installment of this series. And I’ll also discuss how Minibeds-on-Plastic gardening is not your typical black plastic gardening concept because it has NONE of the common complaints that gardeners who use black plastic usually have.